Show your love of all things dog with this perfect little catch all for coins, folded money, business cards, ID cards, and other keepsakes. A perfect little gift for both the dog loving adult or child! Zippered to keep the contents secure, neoprene rubber making it rugged yet soft, all at a perfect size (approx. 4" x 5") to fit anywhere. Our custom design is printed, then we press onto each pouch one by one. The design is permanent and is identical on both sides of the pouch. 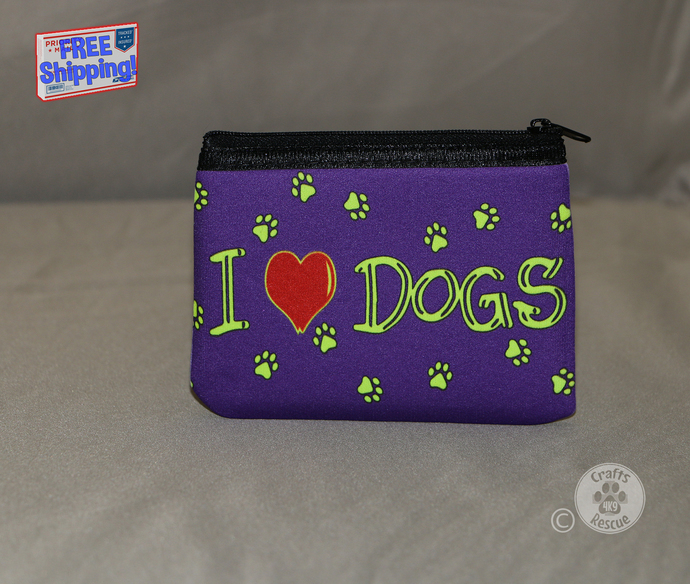 NOTE: This listing is for ONE, zippered neoprene pouch, with "I [heart] DOGS" text and paw print design on a purple background.